The best way to enjoy your Christian experience is by connecting with your bible. What do we mean by that? Can you identify with any of its stories? Which ones have the most meaning for you? This week’s BeTheSohrs topic let’s us in to what it is about your bible that connects with you. The topic is “Favorite Bible Story or Parable”. 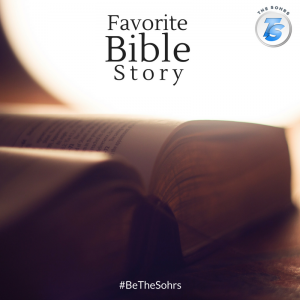 Tell us about your favorite Bible story and why? Share which Bible story you relate to? Give us the Bible story that inspires you? If you could have been a part of any Bible story which would it be? Which Bible story motivates you? Share on Facebook, Twitter, and Google+. Don’t forget to tag your posts with #BeTheSohrs or #TheSohrs.